Ready to dive into 3D printing in the classroom? Your students and colleagues will be energized by having access to the latest technology. But be careful, if you just start printing without a clear instructional plan in place, your 3D printer could become just a toy factory. Here is an instructional outline for MAKING in the classroom. DESIGN: Students design, brainstorm, sketch, hypothesize a solution to the problem. It is critical that each student record the results of this process. The DESIGN may be a drawing on a 3″x5″ card, an entry in a maker journal, a sketch on an iPad or a full design in a CAD program. This is the idea phase. This is the stage where student work can be stored as bits in memory. 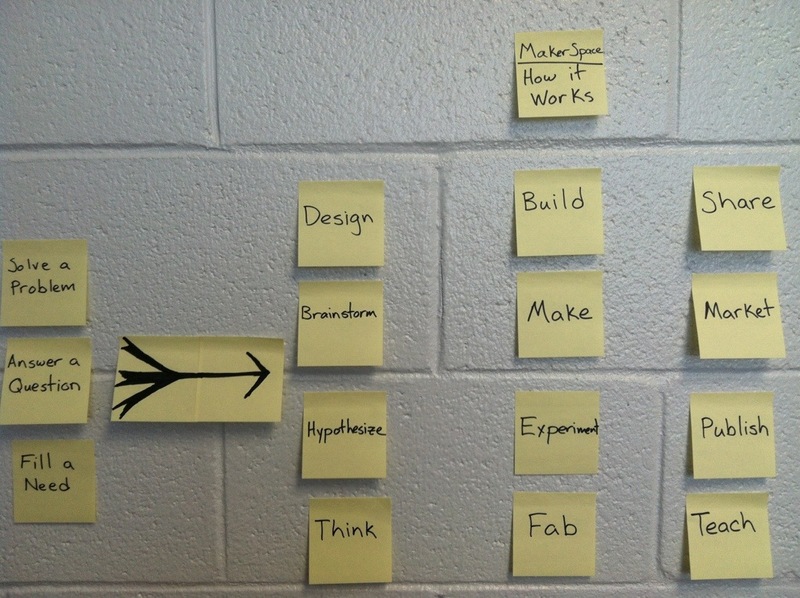 MAKE: Students make, build, experiment, fabricate their design. Review and revision are an integral part of this step. The original design will be modified based on the limits of the tools, materials and skills of the student. What is important is that the student are working from their original design and not just starting from scratch with tools in hand. This is the stage where bits are turned into atoms. SHARE: Students share, market, publish, teach what they have designed and made. Blogs, websites, class share fairs and Thingiverse.com are great places to SHARE. The SHARE step can include a summary of the problem, the design, the solution that they made and how it differs from their original design and a reflection of how the work relates to the class curriculum. Be sure that students SHARE the solutions that didn’t work. This is the stage where the bits and atoms are turned into waves that ripple out and impact others. The purpose of this blog is to explore MAKING in the classroom and expand on the idea of Design Make Share by teaching others. Thanks for this site, and the work done here. I hope to use this as an example for a middle school 3d tech demo. Hopefully to try to inspire some kids at my sons local school. Useing your outline, I hope to get a design challenge off with 3d printed object as the reward for the top ideas voted on by the teachers. I was thinking about a poster that showed the workflow like your post it colection. Thank you again for the great work! Best of luck with your Design Challenge. I’m glad you find the Design Make Teach model useful. The key thing is that students see that the Thinking and Sharing steps are vital parts of MAKING. You might want to 3D print some sort of small badge or token for all the kids that complete the challenge. Maybe something small that could be attached to a back pack zipper pull? Please come back and Share your progress! It was better than I expected! Even though my mendel decided not to work right. Talk about pressure, but in the end I still had kids excited, and they were pushing form me to run a club next year so not bad at all. Thanks again for the outline ideas, and models on thingiverse. At least we inspired some to make or take the next step for their future. Again Thank You! Awesome. Glad it worked out. I understand totally. Gave a demo today using Printrbot Jr. Sliced it using the wrong profile so it hung waiting for the non-existent bed to heat up. 🙂 First layer wouldn’t stick on the pre-sliced model I tried. Keep up the good work. I appreciate the clarity and simplicity of your outline. It will be a helpful guide as I put together a class based on these ideas for 5th grade for the coming year. Thanks! Thanks for the awesome feedback. Can’t wait to see all the exciting things your class does next year.